First and foremost, extreme apologies for not posting any article in last two weeks, was stuck deeply in official commitments 😥 Now coming back, in this fourth article of the series – Good Hotels or Accommodation options near Pangong Tso Lake, I am enlisting down some of the preferred places to stay around Pangong Tso lake – Ladakh which range from Rs 700-800 per person at home stay and goes beyond Rs 5000 for a camp or room for two depending upon comfort, meal plan and facilities they offer. 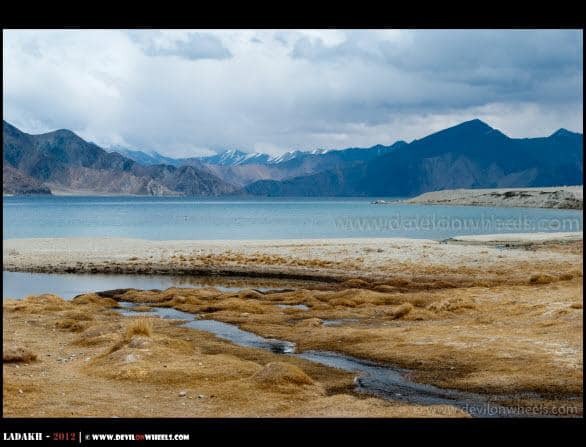 Pangong Tso lake is a remote place and though accommodation options are good in number but fairly limited to tented accommodation or home stays. You can refer the list of below guest houses or hotels or camping resorts compiled after reading various resources/reviews of many people over Internet mainly IndiaMike and BCMT forums (as said earlier, of course, I cannot stay in all of them 😉 ). At Pangong Tso Lake, if you want to stay near the banks of the lake then tents are the only option for you. Otherwise, there are several options available in Sapngmik and few at Lukung which are very near to lake (about 150-200 Mtrs) with full view of it from the rooms. If you do not prefer to stay in tents and want attached western style toilets then there is only one cemented rooms hotel at Pangong Tso (highly priced), leased by JKTDC and named Pangong Camp Resort where you can get such rooms. 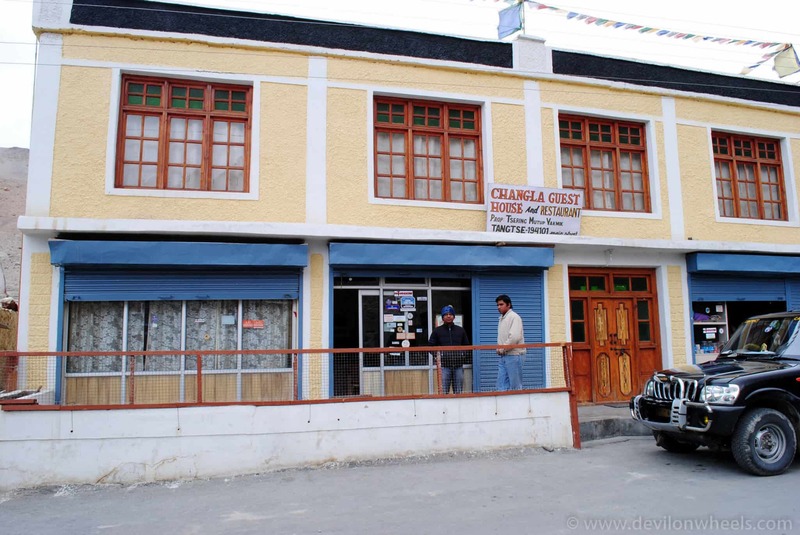 Otherwise, Tangste is the place for you, about 34 KMs from Pangong Tso, where you will find 2-3 guest houses having rooms with attached toilets. Homestays available at Spangmik does offer ladakhi style rooms but most of them have shared toilets or toilets outside the house. The article has been updated to match the current prices of most of these hotels or campsites or homestays for the year 2016. Padma / Gongma / Sasoma Guest House – Home Stays at Spangmik: Mostly, every house in Spangmik village or Man – Merak village acts as home stay and all offer similar facilities at similar and very cheap price range. But, excellent views for the price you pay per night 🙂 … There are clean toilets, some of them western too but not attached. No hot water in most of them but to save 1500 buck you can of course quite bathing for a day in such cold conditions :lol:. Basic food as prepared for other ladakhi family members too. No electricity.Padma guest house offer a great view of Pangong Tso right out of your room’s window. Sasoma is a good one and so as Gongma guest house. There is no way to book them in advance as there is no connectivity and you need to reach there and book the room for you. Price Range: Rs 700 – 1000 for a double bedroom. Some include meals too. Himalayan Retreat – Spangmik, Pangong Tso: recommended, comfortable and tented accommodation with attached western toilets, electricity source for limited period. Price Range: Rs 3500 for tents with two meals (MAP) after special rates for DoW. Pangong Camp Resort – Spangmik, Pangong Tso: This is the only cemented building near Pangong Tso which is leased by JKTDC. It has attached western style toilets and hot water is available too but in buckets. Rooms are clean, food and services are good but very high prices. Runs almost booked always and many a times overly booked, so check twice if you book it. Eco Huts – Lukung, Pangong Tso: Comfortable luxury tented accommodation with attached western toilets. Own electricity source. Mostly run full, very high prices (about Rs 3000) but OK to stay. MarTseMik Camping Resort – Spangmik, Pangong Tso: Comfortable luxury tented accommodation with attached western toilets, own electricity source. Run by same owner who runs Eco Huts at Lukung Village. Mostly run full, very high prices for luxury tents. Other dormitory style dhabha tents and camps: There are many camping/tents options available at Pangong Tso running from Lukung Village till Spangmik Village apart from the above mentioned names. The prices start from Rs 500 – 600 and goes well above Rs 3500 depending upon the luxury, comfort and services like attached toilets, hot water, all meal plans etc. Dothguling Guest house, Tangste: Bollywood blockbuster movie – 3 Idiots Fame!! Recommended. Nice, clean and large rooms. Clean western as well as ladakhi style toilets, hot water in buckets. Yakmik Changla Guest House, Tangste: OK to stay. Clean room. Clean western as well as ladakhi style toilets, hot water in buckets. Gas powered heater and average food. I stayed there in 2012 and found it quite comfortable. In off/late season (late September types or early October), it will be difficult to get accommodation at Pangong Tso as most of the tents pack up. The only option in that case will be home stays at Spangmik village and hotel/guest houses at Tangste village. Homestays at Spangmik may turn out less comfortable than hotel/guest houses at Tangste with respect to some facilities like lack of western style and attached toilets with many of them. Always advisable to carry your own Sleeping bags at least in case you prefer more hygiene over being happy go lucky types. In peak season, since Pangong Tso has only one cemented building with western style toilet that is Pangong Camp Resort (leased JKTDC accommodation) it might be difficult to get any rooms if you do not pre-book it. Of course, if its budget suits you 😉 … Otherwise, try your luck with costly tents or extremely cheap homestays at Spangmik village. If you want to stay right on the banks of Pagong Tso, then there is no option and you can stay near the lake then the only option will be tents. Otherwise, for me best bet would be to try some homestay in Spangmik village of course with a little pain of no bathing for a day and no attached toilets. I hope you find the above list of hotels or accommodation options near Pangong Tso Lake – Ladakh useful for your upcoming Leh – Ladakh trip. If you happen to know any updated contact numbers or missing contact numbers of these hotels or any other nice and good option of stay near Pangong Tso Lake – Ladakh, kindly leave a comment as it will be helpful to others fellow travelers as well. If you have ever stayed at any of these hotels, please share your experience with us too. we are 3 guys visiting pangong on october 4th.. Is there any budget hotels below 1500 is available there ? And what may be the climate ? Accommodation replied in another comment. Climate will be quite cold especially at night and morning with cold winds. we are 3 guys visiting pangong on october 4th.. Is there any budget hotels below 1500 is available there ? Tony, there are quite a few homestays in PAngong tso which will fit that budget. Also, as the season is over, you will find other camps or Himalayan wooden cottages and crack a deal for it. We are a couple who would be visiting Ladakh between Oct 12 – Oct 21, 2017. Just wanted to enquire whether stay options will be available in Pangong area if one visits around 16-17 october. I have checked online and not many options are shown. I tried offbeat escapes but they do not have anything for those dates. Please advise. You must be prepared for the cold conditions at Pangong Tso. It will surely be quite cold, most of the camps wind up by end of September or first week of October. I assume even Himalayan Wooden Cottages also wrap up by mid-October. So, it will be hard to book online and rely upon on spot booking at home stays near by in the villages. Else stay at Tangtse village, about 34 KMs from Pangong tso in a guest house to beat the cold. We are carrying tent , Local would allowed us to use our tent? Thank you very much! Your site is the best for travellers <3 . Your blogs here have been really helpful so far in planning our trip to Leh and around in Sept 2017. I was wondering if you have any budget stay suggestion fro Sarchu as well. Please do share. Ankita, best will be to land there at Sarchu and bargain on the spot. Do you think we should pre book the hotel at pangyong? Or we can get it easily the day we travel to pangyong. I will be travelling with local taxi so assuming driver can help us finding some hotel or home stay. Yes Tanmay, if you are not too much fussy about the stays, you will easily find something on the spot at Pangong tso. That was pretty great info. Best option will be to get a taxi for yourself. For the leh – ladakh taxi union rate list 2017 – 18 including the contacts of some reliable taxi drivers within Leh – Ladakh, check the link here. You can get about 12-15% of discount by directly getting in touch with drivers and of course, talking in person rather on phone always help in bargaining more. You can call the local drivers directly to connect with them and check the more comprehensive List of Taxi Drivers for Ladakh – Srinagar – Leh – Manali with recommendations/reviews for DoW community members. 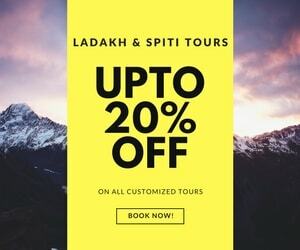 This is the best source of information for leh-Ladakh trip. Me and my husband would be travelling Leh from 28th July to 6th August. 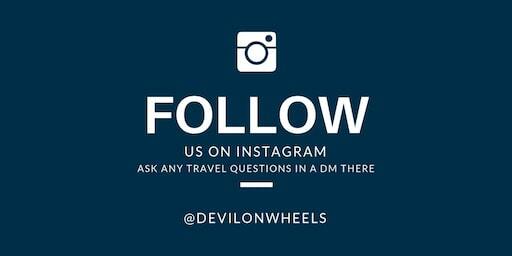 We would be reaching manali 28th July morning, I have couple of questions. a) Do we get rented bike for one sided from Manali to Leh and then we can drop that bike in Leh ? b) Do we get shared taxi option from Manali to Leh or from Leh to Manali ? 1. I will not recommend spending that much money on one way bike rentals. Best is to rent bike in Leh, better and safer. 2. Yes, shared taxis are available but best will be to either have tourist shared taxi so that you stop at tourist spots on Manali – Leh Highway OR take HPTDC deluxe bus service.